This post is part of our Road to re:Invent series. In the weeks leading up to AWS re:Invent in Las Vegas this November, we&apos;ll be posting about a number of topics related to running MongoDB in the public cloud. Learn how to easily integrate an AWS Lambda Node.js function with a MongoDB database in this tutorial. 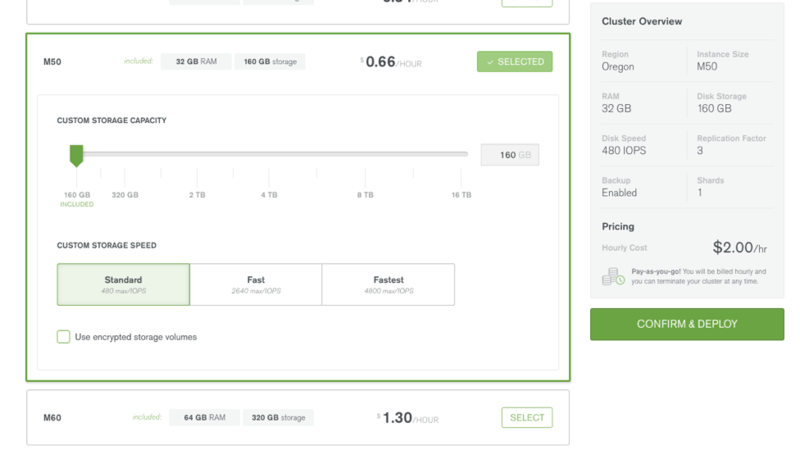 Register with MongoDB Atlas and use the intuitive user interface to select the instance size, region, and features you need. 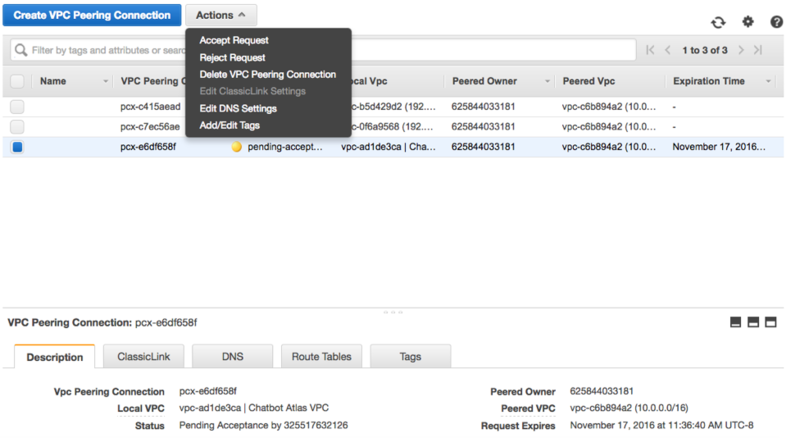 Important note: VPC Peering is not available with MongoDB Atlas free tier (M0). 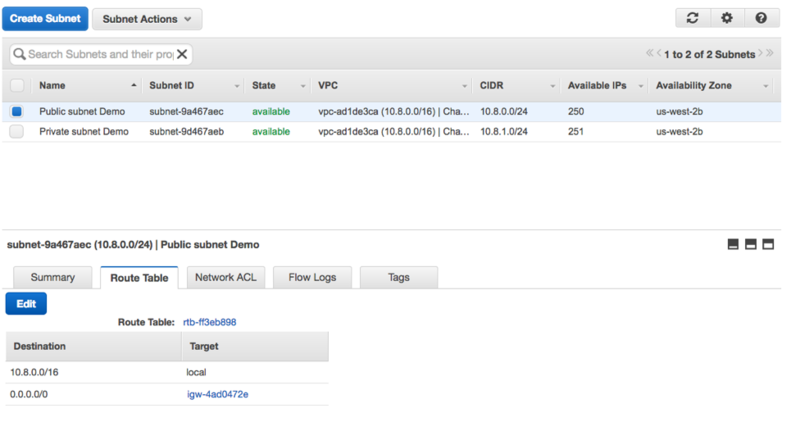 If you use an M0 cluster, allow any IP to connect to your M0 cluster and switch directly to the Set up AWS Lambda section. 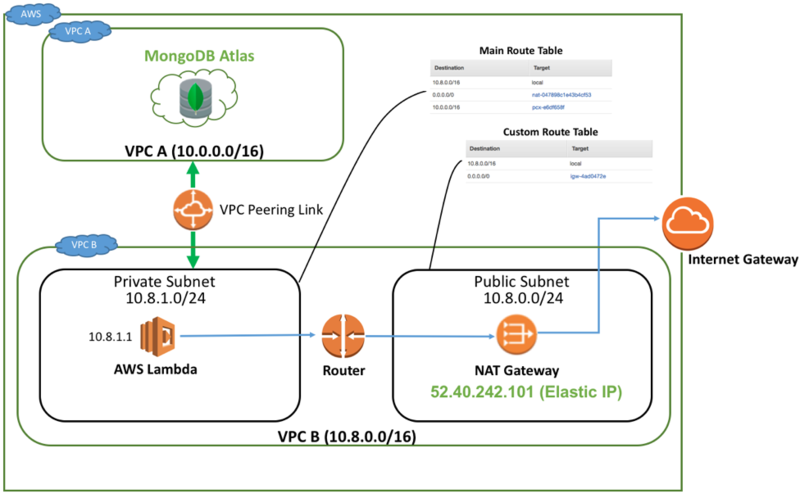 MongoDB Atlas enables VPC (Virtual Private Cloud) peering, which allows you to easily create a private networking connection between your application servers and backend database. Traffic is routed between the VPCs using private IP addresses. 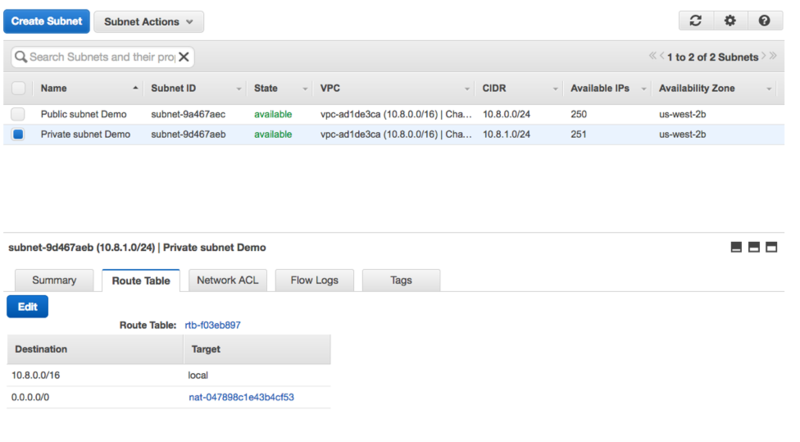 Instances in either VPC can communicate with each other as if they are within the same network. 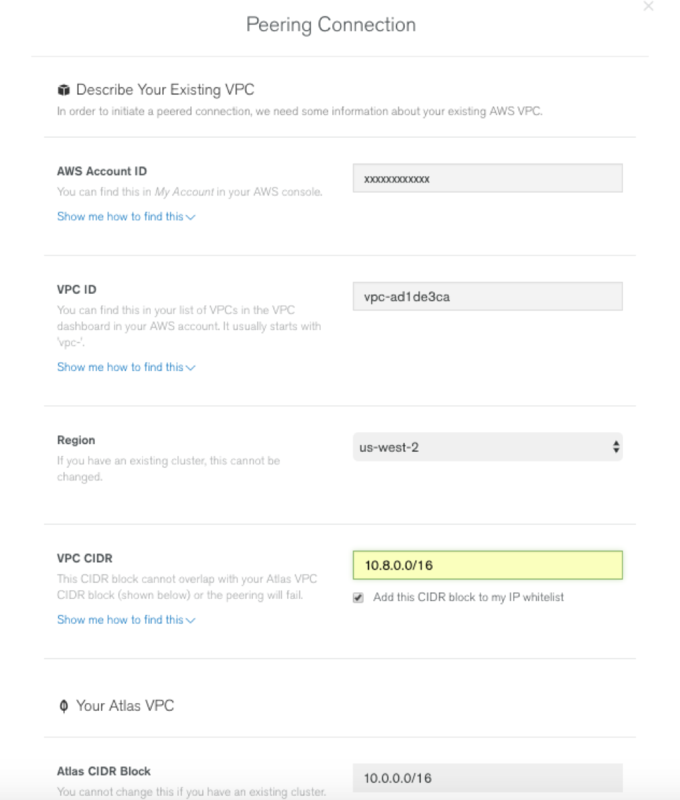 Note, VPC peering requires that both VPCs be in the same region. Below is an architecture diagram of how to connect MongoDB Atlas to AWS Lambda and route traffic to the Internet. 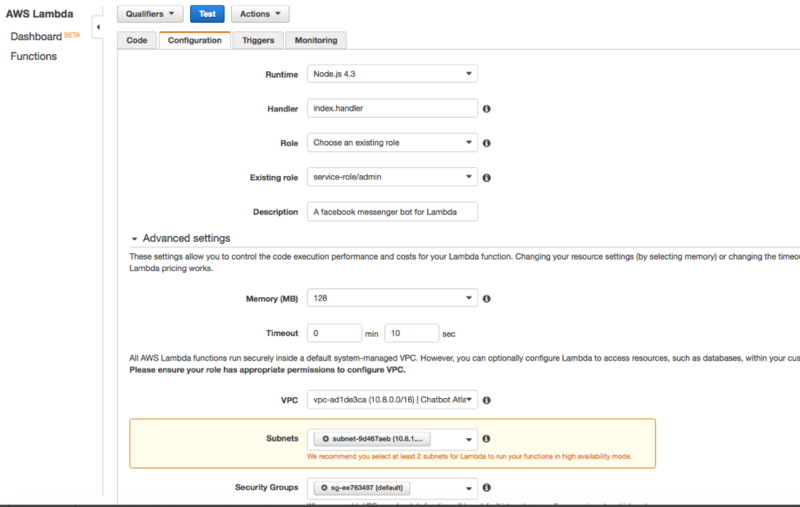 Next we will create a new VPC, which you will attach to your Lambda function. Next, let&apos;s check the public subnet to see if it’s configured correctly. Select Public subnet and the Route Table tab in the lower window. You should see 0.0.0.0/0 connected to your IGW. The IGW will enable outside internet traffic to be routed to your Lambda functions. We will now verify that the routing is set up correctly. 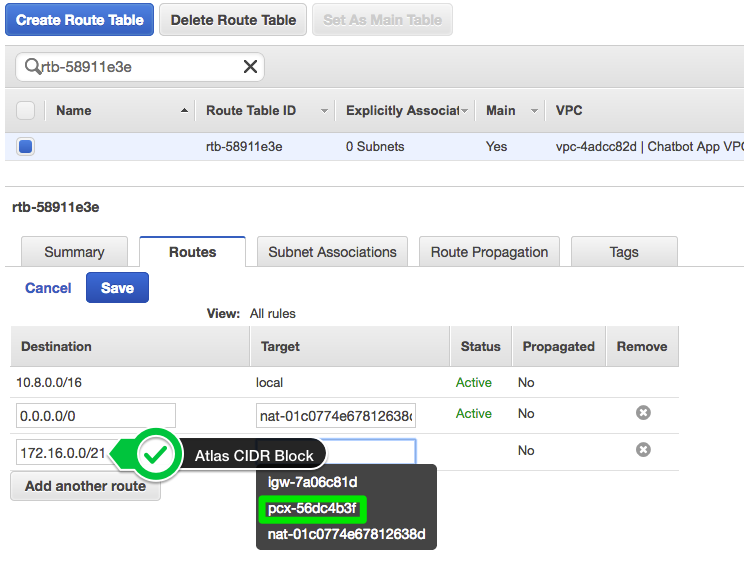 Go to the Route Table of the Private Subnet in the VPC you just set up. In this example, it is rtb-58911e3e. You will need to modify the Main Route Table (see Figure 1) to add the VPC Peering connection. This will allow traffic to be routed to MongoDB Atlas. Click in the Target field. A dropdown list will appear, where you should see the peering connection you just created. Select it and click Save. Create your API name, select dev as the deployment stage, and Open as the security. Then click Next. Press Next, review and create your new Lambda function. This is the piece of code we&apos;ll need later on to set up the Facebook webhook to our Lambda function. Next, we will need to set up the API gateway for our Lambda function. The API gateway will let you create, manage, and host a RESTful API to expose your Lambda functions to Facebook messenger. The API gateway acts as an abstraction layer to map application requests to the format your integration endpoint is expecting to receive. For our example, the endpoint will be our Lambda function. Click on Integration Request. This will configure the API Gateway to properly integrate Facebook with your backend application (AWS Lambda). 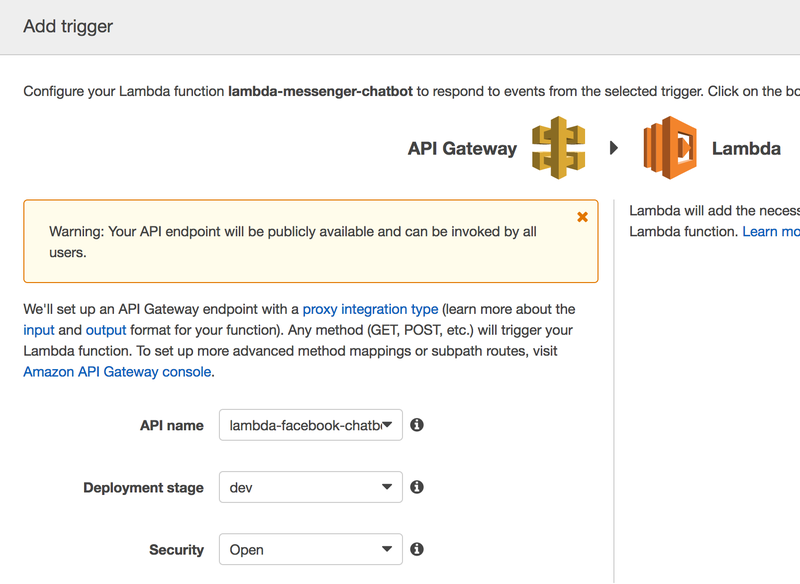 We will set the integration endpoint to lambda-messenger-bot, which is the name I chose for our Lambda function. Uncheck Use Lambda Proxy Integration and navigate to the Body Mapping Templates section. The mapping template will structure the Facebook response in the desired format specified by the application/json template. The Lambda function will then extract information from the response and return the required output to the chatbot user. For more information on AWS mapping templates, see the AWS documentation. Go back to Services->API Gateway->[your Lambda function]->Resources->ANY and select Method Request. In the Settings section, make sure NONE is selected in the Authorization dropdown list. If not, change it NONE and press the small Update button. Facebook makes it possible to use Facebook Messenger as the user interface for your chatbot. For our chatbot example, we will use Messenger as the UI. To create a Facebook page and Facebook app, go to the Facebook App Getting Started Guide to set up your Facebook components. Go back to your Facebook App page and in the Add Product page, click on the Get Started button next to the Messenger section. Scroll down and in the Webhooks section, press the Setup webhooks button. A New Page Subscription page window should pop up. Enter your API endpoint URL in the Callback URL text box and in the Verify Token text box, enter a token name that you will use in your Lambda verification code (e.g. mongodb_atlas_token). As the Facebook docs explain, your code should look for the Verify Token and respond with the challenge sent in the verification request. Last, select the messages and messaging_postbacks subscription fields. In the Webhooks section, click on Select a Page to select a page you already created. If you don&apos;t have any page on Facebook yet, you will first need to create a Facebook page. Once you have selected an existing page and press the Subscribe button. Scroll up and in the Token Generation section, select the same page you selected above to generate a page token. The first time you want to complete that action, Facebook might pop up a consent page to request your approval to grant your Facebook application some necessary page-related permissions. Press the Continue as [your name] button and the OK button to approve these permissions. Facebook generates a page token which you should copy and paste into a separate document. We will need it when we complete the configuration of our Lambda function. 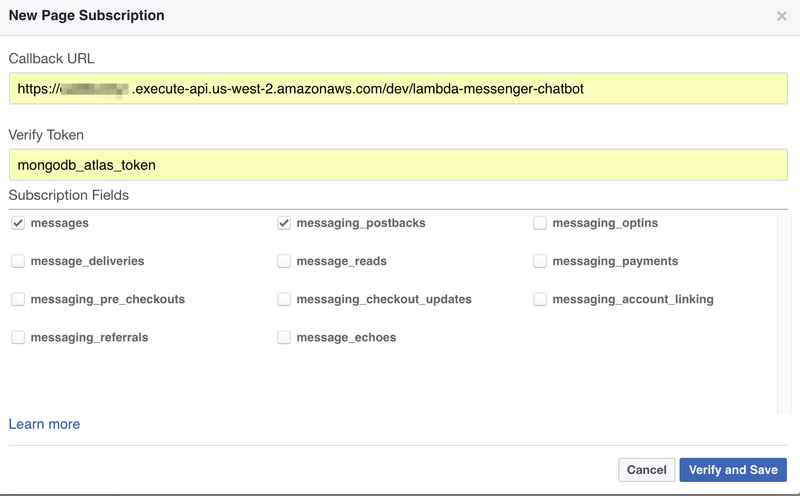 We will now connect the Facebook Messenger UI to AWS Lambda and begin sending weather queries through the chatbot. Below is the index.js code for our Lambda function. The index.js file will be packaged into a compressed archive file later on and loaded to our AWS Lambda function. We are passing the MongoDB Atlas connection string (or URI) and Facebook page token as environment variables so we&apos;ll configure them in our Lambda function later on. For now, clone this GitHub repository and open the README file to find the instructions to deploy and complete the configuration of your Lambda function. Save your Lambda function and navigate to your Facebook Page chat window to verify that your function works as expected. Bring up the Messenger window and enter the name of a city of your choice (such as New York, Paris or Mumbai). AWS Lambda functions are stateless; thus, if you require data persistence with your application you will need to store that data in a database. 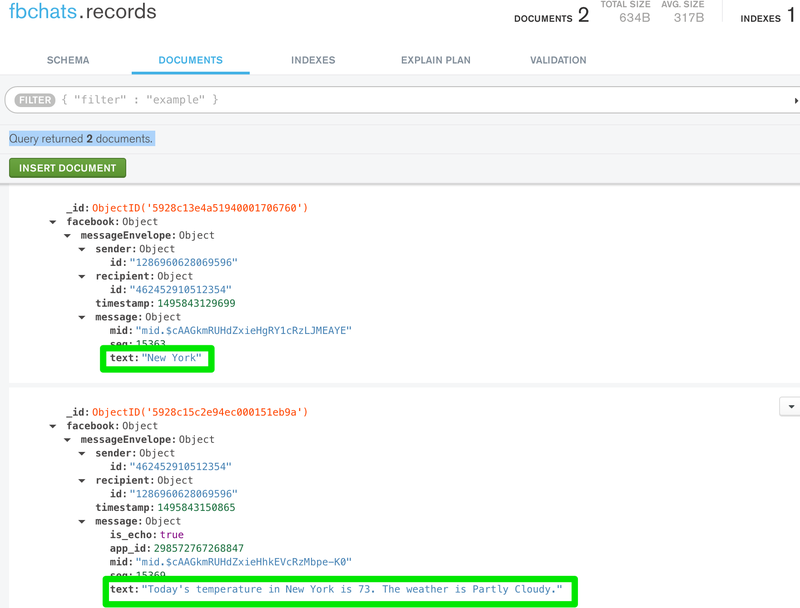 For our chatbot, we will save message information (text, senderID, recipientID) to MongoDB Atlas (if you look at the code carefully, you will notice that the response with the weather information comes back to the Lambda function and is also stored in MongoDB Atlas). Before writing data to the database, we will first need to connect to MongoDB Atlas. Note that this code is already included in the index.js file. sendToAtlas will write chatbot message information to your MongoDB Atlas cluster. Note that the storeInMongoDB and sendToAtlas methods implement MongoDB&apos;s recommended performance optimizations for AWS Lambda and MongoDB Atlas, including not closing the database connection so that it can be reused in subsequent calls to the Lambda function. Note that we&apos;re storing both the message as typed by the user, as well as the response sent back by our Lambda function (which comes back to the Lambda function as noted above). In this blog, we demonstrated how to build a Facebook chatbot, using MongoDB Atlas and AWS Lambda. MongoDB Atlas can also be used as the persistent data store with many other AWS services, such as Elastic Beanstalk and Kinesis. To learn more about developing an application with AWS Elastic Beanstalk and MongoDB Atlas, read Develop & Deploy a Node.js App to AWS Elastic Beanstalk & MongoDB Atlas. To learn how to orchestrate Lambda functions and build serverless workflows, read Integrating MongoDB Atlas, Twilio, and AWS Simple Email Service with AWS Step Functions. For information on developing an application with AWS Kinesis and MongoDB Atlas, read Processing Data Streams with Amazon Kinesis and MongoDB Atlas. To learn how to use your favorite language or framework with MongoDB Atlas, read Using MongoDB Atlas From Your Favorite Language or Framework.